Bradley Roby has struggled with consistency in his five-year career in the NFL, and that trend continued this season with him posting a career-low grade of 59.8— one year after posting a career-high grade of 78.3. The Broncos deployed Roby on 926 snaps this season, and he responded by allowing 65.9% of passes thrown his way to be caught and a passer rating of 117.3 when targeted (both career-highs). Roby saw 252 more snaps this season, which translated to only four more targets, but he allowed nearly 300 more yards and 200 more yards after the catch than he did last season. He was tied for 20th in targets this season (82) and gave up 823 yards (fourth most among corners). He was also near the bottom in terms of efficiency among cornerbacks, allowing 1.48 yards per coverage snap (102nd among 131 qualifying corners). 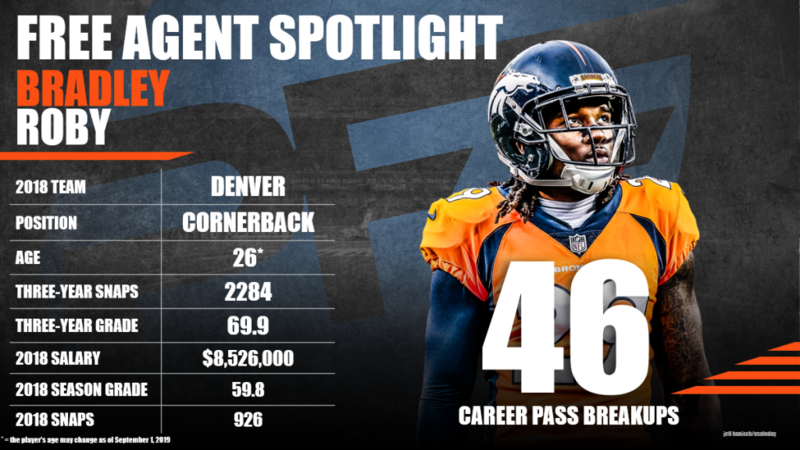 Subscribe to Pro Football Focus’ ELITE subscription to research Bradley Roby’s grades, advanced stats, snaps and more in Premium Stats 2.0.